I love a fresh start, and I hate that I am the nine millionth person to say something like that this week. Even though it's cliche, it's been on my mind, so it seemed like the right thing to share. The trouble with fresh starts is that they lead to monotonous, middle-of-the-road plateaus. When I was teaching it felt so good to start off the year with a clean room, organized desk, and aspirations for implementing all that I'd learned over the summer. But by November I was falling into the same clutter-magnet habits and contemplating how many of the 900 items on my list I could check off by 3:15 midnight. It's funny how quickly normal life chips away at dreams and goals. This fear of not reaching a goal and feeling like a failure paralyzes a perfectionist like me. My best intentions are obliterated by my "everything has to change right now" mentality. So when it comes to eating elephants, I agree with the saying that it happens "one bite at a time." Here I am, at the start of 2015, ready to try one small thing at a time. So instead of looking at how big of a mess my house is, I'm honing in on this problem I have with dishes. They appear out of nowhere, caked with yuck, towering in piles on the counter. One small thing I'm trying is to empty the clean dishes out of the dishwasher first thing in the morning. That's it. When it comes to breastfeeding, I dream of change on a macro level where moms don't have to fight a battle to nurse their newborns because they have an extensive support system of friends, family, and knowledgeable medical professionals who can give them accurate advice about breastfeeding. Talk about a ginormous elephant. I can't make that change happen overnight. 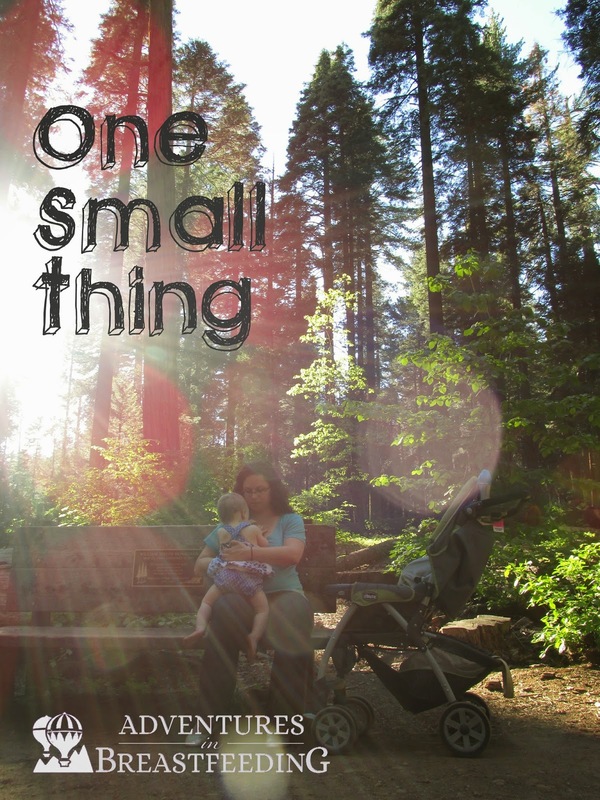 But I can do one small thing. I'm going to start reaching out to new moms I know, just to touch base with them after baby comes. Not to apply pressure. Not to coerce them to breastfeed. Just to say, "Hey, I know this isn't easy. If you need advice, or just need to vent, I am here!" I feel confident that this small thing could lead to another and before long, the elephant will be history.